If anyone doubts that China retains an unreformed Leninist political system, then the goings-on inside the Great Hall of the People over the past few hours should put them straight. Firstly, the president - and general secretary of the Communist Party - was seated alongside a nonagenarian former leader who is simultaneously thought to wield some political power while also frequently rumoured to be dead. The appearance of Jiang Zemin, whose large glasses and wide smile lead his admirers to affectionately call him "The Toad," caused a ripple of excitement on Chinese social media. "He's alive and well and chatting away!" said a typical post on Weibo - before the censors quickly got to work. There is nothing quite so Leninist as a country blocking discussion about the appearance, in full view, of a former leader at a major set-piece event broadcast on national television. Some comments, though, still find a way through. "Why can't I forward a picture of a toad?" reads one. "Can't I think of a toad? I'm thinking about a toad." For now, China cannot stop its citizens thinking about a toad, although the way things are going, some fear that day may come. And then Xi Jinping spoke for the best part of three and a half hours. Not quite a Fidel Castro length but enough to make another of Mr Xi's predecessors, Hu Jintao - also seated next to him on the opposite side to Mr Jiang - look like a study in brevity. 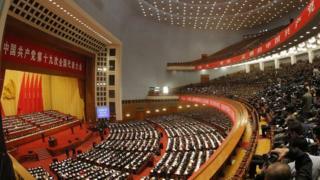 Mr Hu spoke for a mere one hour and forty minutes at his last Congress in charge. And with Xi Jinping in full flow, journalists more observant than I counted at least ten occasions when the elderly Mr Jiang looked at his watch. Mr Hu appeared to briefly tap his as a tired-looking Mr Xi took his seat again once the speech had finally ground to an end. But of course, following the best traditions of Kremlinology, there are always things worthy of note in such speeches, regardless of the whopping duration, the predictable political rhetoric or the tight control of the message. There were, perhaps, a few more moments of spontaneous applause than one might usually expect - for example when Mr Xi touched on issues like bringing real estate speculation under control, and for one of his driving obsessions, poverty reduction. The language was slightly less formal than your average leader's speech and Mr Xi's deep and humble bow to delegates at the end was met with genuine warmth and approval. These are signs of his appeal beyond his party's factional interests - to the country as a whole, in fact. He has been enormously successful in this throughout his first term, for which he is accused of building a cult of personality. But as Mr Xi embarks on his next five years in power, the opening of this party congress is a good time to remind ourselves about the real nature of his project, something he has been making clear from the start. Anyone who ever thought that as China grew economically stronger it would inevitably become politically freer is wrong. His abiding preoccupation is keeping the Communist Party in power. So expect no short sound bites or shirt-sleeved attempts at working a crowd. And definitely no chat-show appearances for ageing political leaders, especially ones who remain popular because they actually did seem to have a bit of personality, like Mr Jiang, "The Toad". It's just not what these systems do. China's rigid political Leninism is here to stay.